The Nutrient Management Facility (NMF) located in Alexandria, VA is the recent recipient of the Envision Platinum award. The project, owned by Alexandria Renew Enterprises (AlexRenew) is the first in Virginia and the D.C. metro area to earn an Envision award. 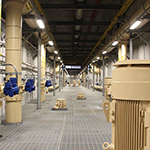 The Nutrient Management Facility includes 18 million gallons in tank capacity with associated pumps, chemical analysis equipment, and an extensive odor control system. It also includes a lit, regulation athletic field located on top of the process tanks, created as a community amenity. As the largest construction project of the award winning State-of-the-Art Nitrogen Upgrade Program (SANUP), the NMF contains a sustainable planning, design, and construction program cooperatively developed by AlexRenew and lead consultant CH2M. To learn more about this project, Click Here to visit the project award page.